The name Gorman, originally O'Gorman or O' Gormog, comes from Irish Gaelic, and means 'descendant of Blue' or 'descendant of young Blue'. Calum's Gorman ancestors have so far been traced back to the early Nineteenth Century, but very little has been established yet of the family's history. Edmund was Calum's and Jamie's five times great grandfather. Very little is known about Edmund. In 1804 he is noted as a sponsor at a baptism in the parish of Templeorum, the child being Mary Commins of Three Bridges, daughter of Michael Commins and Nancy Mangan. (The other sponsor was Judy or Judith Phelan). Mary was likely Edmund's niece by marriage. 1826 Edmund erected a gravestone to his 14 year old son John at Owning Parish Church, and two years later he was recorded in the Tithe Applotment Books for Garrynarea, parish of Owning, in 1828. 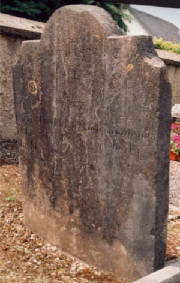 Edmund Gorman was eventually buried in Owning Roman Catholic Churchyard, near Piltown in County Kilkenny. NB: It is possible that Edmund had a sister or daughter called Margaret, as a Margaret Gorman is noted as having married a James Keating from Three Bridges on February 16th 1817. The witnesses were James Roach and Michael Cummins (Source: RootsIreland.ie). John was baptised on November 13th 1812 in Templeorum parish, County Kilkenny. He was resident at Garnara (Garrynarea), and his parents were noted as Edmund Gorman and Catherine Commins. The sponsors were Richard Butler and Catherine MacGrath. Little is known of John's life as a child, except to say that he died at the age of 14 and was buried in Owning Parish Church. Co.Kilkenny. Erected by Edmd Gorman in memory of his son John Gorman who depd this life April 26th 1826 aged 14 years. Thomas was Calum's and Jamie's great great great grandfather - see below. Edmund was Calum's and Jamie's great great great grandfather. According to family tradition, Edmund was a miller who worked at Three Bridges, Garrynarea, County Tipperary. Edmund married Bridget Congrave, on October 14th 1826 in Templeorum parish. At the time Edmund was resident at Three Bridges, although Bridget's address is not given in the Catholic marriage register. The witnesses were Honora Doran and Bridget Fogarty. It is not known when Edmund died, but it would appear to have been before 1850, as Bridget was noted in Griffith's Valuation of Garrynarea as the householder (as Bridget Gorman). It is not known either where he was buried, although it is likely that he was laid to rest in Owning Parish Church in the parish of Templeorum. b: abt 29 Oct 1827 d: ???? John was baptised in Templeorum parish, County Kilkenny, on October 29th 1827. His parents were listed as Edmond Gorman and Bridget Congreve, and resident at Three Bridges. The sponsors were Patrick Kennedy and Mary Burke. Calum's and Jamie's three times great grandfather - see below. Patrick was baptised in Templeorum parish, County Kilkenny, on January 8th 1837. His parents were listed as Edmond Gorman and Bridget Congrive, and resident at Garrynarea. The sponsors were William Tobin and Ellen Barron. Patrick was said to have moved to Paris in France and to have married a woman by the name of Rosella Cowslie. With the money he earned in France, he was able to help his brother Michael to build another house at Three Bridges in Garrynarea. However, the 1901 census shows that Patrick was not married and aged 62, residing at Garrynarea with his 45 year old housekeeper sister Bridget, who was also unmarried. It may be that another brother therefore moved to France and sent the money back or that Patrick had some other connection to Rosella. Patrick was certainly the owner of both his and his brother Michael's houses though in 1901 as noted on Form B1 of the census. He was described as a labourer, and both he and his sister were Roman Catholic and able to read and write. Patrick died on 13 AUG 1908 at the workhouse in Carrick-on-Suir, he having suffered for 'some months' from chronic nephritis. The death certificate noted him as a 70 year old bachelor. 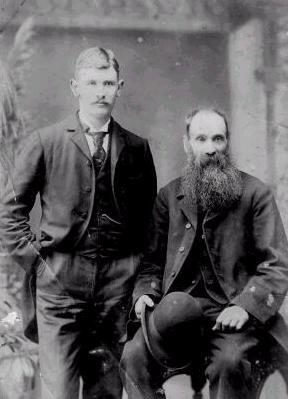 The informant was James Walhs, occupier of the workhouse (GRO Ireland, 1908, D, Group Reg ID 4989379, Carrick-on-Suir). In 1911, Patrick's house was now inhabited by a 50 year old Patrick O' Gorman, a Pensioner and ex-Sergeant of the Royal Irish Constabulary. 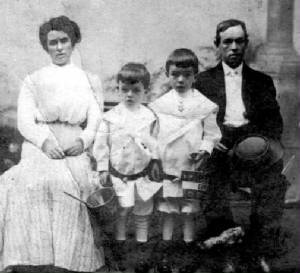 This Patrick was married to 40 year old Catherine (from County Cork) in approximately 1903 and the couple had two children - 5 year old Margaret Mary Gorman, a scholar, and 2 year old Thomas Patrick O' Gorman. It is unclear if this Parick O'Gorman was connected to the family in any way. b: abt 18 Mar 1839 d: ???? William was baptised in Templeorum parish, County Kilkenny, on March 18th 1839. His parents were listed as Edmond Gorman and Bridget Cosgrave, and resident at Three Bridges. The sponsors were William Tobin and Mary Burke. All that is known of Bridget is that she lived next door to Michael Gorman at Three Bridges in Garrynarea with her brother Patrick, for whom she acted as housekeeper. The 1901 census shows that she was aged 45, Roman Catholic, and able to read and write. Michael was Calum's and Jamie's three times great grandfather. Michael's death certificate from 1905 noted that he was aged 76, placing his birth year at approximately 1829. However, his baptismal record in Templeorum parish, County Kilkenny, is dated May 3rd 1834, with his parents listed as Edmond Gorman and Bridget Congrave, and resident at Three Bridges. The sponsors were Patrick Roach and Catherine Rafter. According to Michael's great granddaughter, Mary Pauline Giles (nee Prendergast), at some point prior to 1901, Michael made his way to the United States for a period, but soon returned to Ireland. On August 6th 1861 Michael married Bridget Kirwan, with both residing at Three Bridges, Garrynarea. Bridget would seem to be the daughter of John Kirwan and Mary Walsh, who was baptised on February 1st 1841, and resident at Tybroughney (Tibberaghny). The couple lived in a house in Three Bridges which family tradition says was paid for by his brother Patrick, who was earning good money in Paris, France. In the 1901 census for Garrynarea, Michael was noted as a 65 year old widower and agricultural labourer, living next door to his brother Patrick. He was Roman Catholic, able to read but not write and was born in County Kilkenny. With him were his 28 year old agricultural labourer son Michael (unmarried) and 23 year old daughter Ellen (noted as married). Both could read and write, and were born in County Kilkenny. In the second page of the House and Building Return (Form B1) from the census, it is noted that the property was owned by Patrick. It had one out office or farmsteading, four rooms, two windows at the front, and three people residing within. Whilst Michael's schedule forms were picked up by the enumerator, RIC Constable Patrick Haran, on April 5th, the returns from Patrick's house weren't picked up until a day later. Michael eventually died on 19 FEB 1905 at Garrynarea. His record notes that he was aged 76 and a widower, with the cause of death listed as acute bronchitis, suffered for 14 days. His son Michael was the informant, also resident at Garrynarea. (GRO Ireland, 1905, D, Group Registration ID 4754264, Carrick-on-Suir). He was subsequently buried in Owning Church graveyard, although family tradition again has it that he was mistakenly interred in the wrong plot! John was born on 1 JAN 1864 at Tybroughney, the son of Michael Gorman, labourer, and Bridget Keiravan. His aunt Mary Keiravan was noted as the informant to the registrar on the following day (GRO Ireland, 1864 B, Group reg ID 8283752, Carrick-on-Suir). John was baptised into the Roman Catholic faith on January 3rd 1864. His parents were noted as Michael Gorman and Bridget Kierwan, with the family resident at Garrynarea. The sponsors were John Walsh and Catherine MacGrath. Mary was born at Three Bridges on 29 MAY 1866, the daughter of Michael Gorman, labourer, and Bridget Keyran. Bridget was the informant to the registrar on 19 JUN. The event was recorded twice in the register, the first instance being scored out after the registrar realised he had inserted the mother's and father's names in the wrong order (GRO Ireland, 1866, B, Group Reg ID 7450892 Carrick-on-Suir). Beside the first entry a note is given, stating a date to be 26 MAY, presumably referring to the birth date, rather than date of registration. Just to add to the confusion on her birth date, the baptismal register for Owning and Templeorum states that Mary was baptised into the Roman Catholic faith on 26 MAY 1866, but born on 25 MAY, a day earlier. Her parents were noted as Michael Gorman and Bridget Kierwan, with the family resident at Three Bridges. The sponsors were Richard Shea and Mary Walsh. This will give you an idea what we look like. Do you think we changed any. Mamie. Patrick was baptised into the Roman Catholic faith on February 12th 1868 His parents were noted as Michael Gorman and Bridget Kierwan, with the family resident at Garrynarea. The sponsors were William Leahy and Bridget Walsh. Michael was baptised on April 30th 1871 in County Kilkenny. he was residing at Three Bridges, Garrynarea, and his parents were noted as Michael Gorman and Bridget Kirwan. The sponsors were Patrick Walsh and Mary Roach. In the 1901 census it is noted that Michael was a 28 year old agricultural labourer residing with his father and sister at Garrynarea in County Kilkenny. He was Roman Catholic and able to read and write. In 1911 Michael was still residing at Garrynarea, noted as an unmarried 37 year old agricultural labourer. His entry is indexed under the name Garman). In the House and Building Schedule (Form B1), there is no name noted for the owner, simply Michael's name as head of household, though the house next door is noted as being owned by Patrick Gorman. b: abt Mar 1875 d: ???? Bridget was baptised on March 17th 1871, her address noted as 'Fodeen', in Templeorum parish. 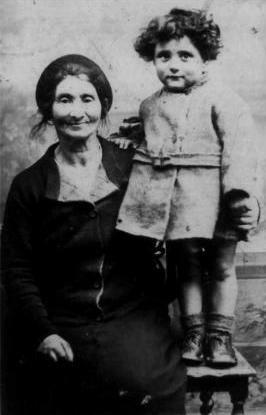 Her parents were noted as Michael Gorman and Bridget Kiervan, the sponsors were Patrick Gorman and mary Cummins. b: abt May 1873 d: ???? Catherine was baptised on May 19th 1873, her address noted as 'Fodun', in Templeorum parish. Her parents were noted as Michael Gorman and Bridget Kerwan, the sponsors were Walter Walsh and Anastatia Drohan. Calum's and Jamie's great great grandmother - see below. Ellen was Calum's and Jamie's great great grandmother. Ellen was born on 1 MAY 1877 at Tinvane, County Tipperary, to Michael Gorman, labourer, and Bridget Kirwan. The informant to the registrar in Carrick-on-Suir on 24 JUL was Mary Kirwan, Ellen's aunt (GRO Ireland, 1877, B, Group Reg ID 11242513 Carrick-on-Suir). Ellen is believed to have married Lawrence Murray at some time between 1894 and 1909, however the record has as yet to found. In 1910 she moved to Amityville, New York State with her husband and daughter Mary, and whilst there gave birth to her second daughter Ailsa. Ellen returned to Ireland about seven or eight years later, where she lived at Three Bridges, Piltown, Co.Kilkenny. Upon her death in 1972, Ellen was buried alongside her grandfather Edmund in Owning Roman Catholic churchyard. Mary was Calum's and Jamie's great grandmother - see Murray page. Ailsa was born in America in Amityville, Long Island, New York State. At the age of seven or eight she moved back to Ireland. Ailsa worked in Jury's in Dublin and then moved over to London to work in Jury's there, but contracted tuberculosis at the age of 21 and died (GROEW D Jan-Mar 1936 Chelsea Vol 1a p.589). She is buried in a cemetery in Maida Vale, north west London.